Around the year 1900, French physician Charles Michel (1850-1935) first realized the importance of oxygen to aid the recovery process from respiratory diseases. Oxygen helped the patients breathe easier and made them more alert by providing pure oxygen to the lung tissues and from there, into the blood. Michel used a small collapsible container around the patient's head, but the oxygen tent, as it was soon called, was soon expanded around a patient's entire bed. Oxygen tents then began to appear in hospitals in Europe and North America. 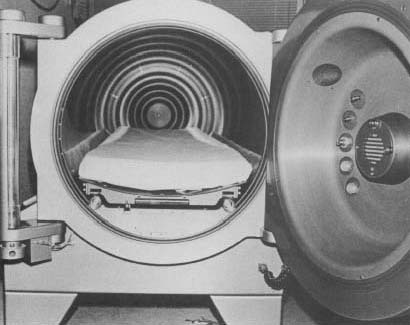 This hyperbaric oxygen chamber-an advanced offshoot of the oxygen tentis used to prevent diver 'bends' and gangrene. an event in which the patient's body has been deprived of oxygen. The gas inside the tent has a higher percentage of oxygen than normally found in air. When the patient is in the tent and breathes, he or she is taking in more oxygen per breath. The tent is usually a dome-shaped hood over a hospital bed. The tent seals out the regular atmosphere so that the patient can breathe only the oxygen-rich air that is forced in at the top of the tent. The tent is also equipped with a pump to keep the air circulating. The amount of moisture (humidity) in the tent is also controlled so that the lungs do not dry out. The carbon dioxide exhaled by the patient is continually monitored and removed. are there any side affects from spending too much time in an oxygen tent? Do you know where I can buy an oxygen tent? I want one to put over a growing area for orchids to keep up the hymidity. My father, Doctor Benjamin Eliasoph, designed the first practical oxygen tent in 1921. There were no plastics, as now available, and the tent was designed to allow the patient inside free movement. The fabric was rubberized material provided by the Goodyear Rubber Company, Aeronautical Division,used in their balloons or "Blimps". There was provision for cooling with ice and removal of carbon dioxide with soda lime. The need for such a device was based on his experience in 1919 during the "Great Influenza" observing patients turning cyanotic (oxygen deprived) as a result of their congested lungs. The system was compact and portable and could be set up easily in a hospital or in a patient's home. Countless thousands of people have benefited from his idea for which he never received any money.